The WASP beret consists of two parts, the Beret Top Piece and Beret Side Flap. The dimensions for each must be calculated as explained below. Please note that my calculations are given in centimeters, which must be converted to inches if not using the metric system. First, you must construct the Beret Top Piece. Use the formula below. For example, if your head size measurement (measure the circumference around your head where you want the beret to fit) is 54 cm (21 ½ inches), the Beret Top Piece should have a diameter of 24.5 cm (9 6/8 inches). A Beret Top Piece with a 24.5 cm diameter has an outer perimeter of 77 cm (this length is important for the Beret Side Flap pattern in Part B). 12.25 x (your head size measurement) / 54 = Radius of the circle formed by your Beret Top Piece. Now, you should be able to make a pattern for the Beret Top Piece suitable for your own head size by drawing a circle on paper with the calculated radius. The outer dimension of the Beret Side Flap (green line in the drawing) is based on the same measurements used for the Beret Top Piece determined in Part A. The inner dimension of the Beret Side Flap (red line in drawing) is based on your head size measurement. The width of the Beret Side Flap (yellow line “h”) is 7.5 cm (3 inches) for a beret that will fit a 54 cm (21 ½ inches) head size measurement. 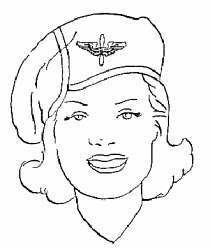 Once you have determined these dimensions, construct the pattern for the Beret Side Flap. Please make certain that extra material is available for the seams around both pieces (seam allowances). All measurements given here are without seam allowances! The front seam of the Beret Side Flap (where it joins together with the Beret Top Piece to form the complete beret) must be a double-welted seam that overlaps (similar to jeans). The seam allowance (about ½ inch) of the lower portion of the Beret Side Flap must be turned back, both to form the double-welted seam at the front and to stiffen up the lower brim of the beret. Once the Beret Top Piece is joined with the Beret Side Flap, you can complete your beret with a dark silk lining and by sewing a thin (one-inch) leather sweatband inside the lower brim of the completed beret.